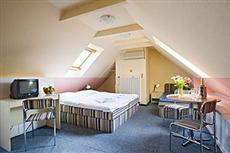 This Prague accommodation is located only 4 km from the center of the city. Those who stay at the hotel will find that it is only a short distance from the zoo. Guests will be able to head into the town where they can visit all of the historic sites such as Old Town Square and the Charles Bridge. The hotel is only 15 km from the international airport, and it is easy to reach by car. Guests that do not have a rental will be able to use public transportation that can take them to the airport and other areas that they want to visit. The nearest tram station is only 100 meters away. The hotel offers 24 double and triple rooms. Some of the amenities in rooms at the Stirka Prague include phones, satellite TV, hairdryers, and tea and coffee making facilities. Those who arrive to the hotel by car will find parking available. The Hotel Stirka Prague offers Internet access in the lobby. Reception is available 24 hours a day, and guests will be able to enjoy a hot buffet breakfast in the morning.